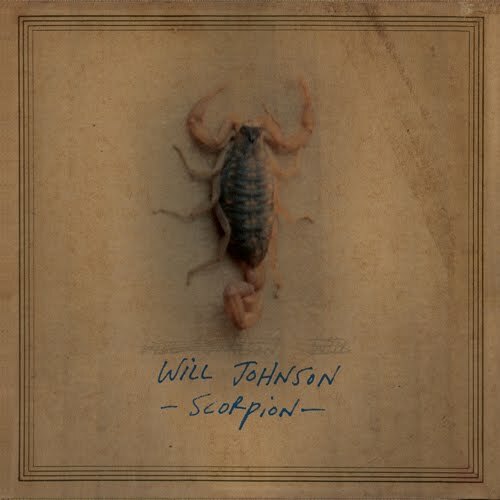 Great news - a new release from Denton, TX artist Will Johnson - a solo record (with help, of course, from some of his talented friends, including Centro-matic bandmates). Scorpion is due out September 11 on Undertow/Thirty Tigers. For this project, Johnson has decided to cut out the middleman and self-release the album direct to fans via Undertow Music/Thirty Tigers. Scorpion was recorded in the wooded outskirts of Denton, Texas, at the studio of longtime bandmate, producer and engineer Matt Pence. Also lending their skills to Scorpion are multi-instrumentalists Scott Danbom, Howard Draper and Magnolia Electric Company’s Mikey Kapinus. You can get a download of the lead track, "You Will Be Here, Mine" - just click here. It's vintage Johnson - languid, slow-burning, with some terrific guitar supporting one of the most soulful voices in rock music. Johnson is hitting the road this fall in support of Scorpion, with his friend and New Multitudes collaborator Anders Parker, playing a mix of traditional club shows and intimate acoustic living-room sets. The Soul Corner - Bobby Womack "The Bravest Man in the Universe"
A first at the Soul Corner - a brand new release. But it qualifies for our Friday feature because it comes from a classic artist, Bobby Womack, and is damn soulful. You may be able to pick up a free download for it like I did today by walking into to your local Starbucks and finding their card with the iTunes Song Pick of the Week. "The Bravest Man in the Universe" is the title track from Womack's new CD. Some of you, like me, may love, while others not, the modern production here, but the man sure can sing and play guitar. The song and entire new CD was produced by UK electronic music pioneer Richard Russell and Damon Albarn (Blur, Gorillaz). Womack of course played with a host of great artists, including Aretha, Janis Joplin, and on Sly and the Family Stone's There's a Riot Goin' On. He wrote "It's All Over Now", popularized by the Rolling Stones. He had worked with Albarn previously, contributing on some Gorillaz music. The B-side for the single is "Places". The Babies were founded by Kevin Morby (who also plays with Woods) and Cassie Ramone (of the Vivian Girls), and has expanded to include Justin Sullivan and Brian Schleyer. I'm a big fan of their loose, lo-fi approach, and "Moonlight Mile" has me eagerly anticipating the release of Our House On The Hill. When I read that The Blakes had left Seattle for their Maine motherland to record their third full length album, I was concerned. Sometimes sequestration in a different environment can produce great works, but it also can lead to insular product, inscrutable to all not involved. Well, I'm happy to report that all is well. Art of Losses is an excellent album -- A wide spectrum alt rock/garage pop thesis and, in my opinion, the most consistent of this band's career. The Blakes have always been a straightforward band. The sound is stripped to the basics rock, with crunchy guitars and powerpop vocals, both of which honor their '60s influences without mimicking them. But straightforward doesn't mean limited. A primary reason I think that the band have been one of the consistently best over the last decade is their ability to coherently and entertainingly express themselves in a variety of styles -- from swampy, bluesy and booze-soaked to dreamy and melodic. I'll provide a few examples, below. In "Sea Fishing (Slow It Down)", The Blakes craft a swaggering slice of rock that wouldn't be out of place in the Rolling Stones catalog. That The Blakes have not yet captured a wider audience is a shame. But for those of you who didn't know about them before, now you have your chance to grab the work of one of the country's finer bands. This is your chance. Don't screw it up. The Mouse That Ate The Cat is a Glasgow indie electro-pop band consisting of Brian Henderson (vocals and synths) and Colin Keenan (guitar). They appeared on these pages a few times in 2011, and have earned a return trip owing to their ability and extraordinary generosity. On the latter point, we have several sets of free songs for you to enjoy and, if you like them, download. Enjoy! The Raveonettes will be releasing Observator, their new LP, early in the fall on Vice Records. For those of us interested in the upcoming delights to be found on the album, the single "She Owns the Streets", became available this month. The song celebrates individuality and punk attitude. Apparently it was written about a street dancer named Loan Tran, who also stars in this video made to accompany the track. As expected, it appears that we can expect another album full of ear candy from my favorite Danish expats. Is it bad form to wish fall to come along sooner? Eternal Summers were known for their lo-fi, jangly, dreamy, punk infused sound through their earlier EPs and debut album. Correct Behavior is the band's sophomore LP, and its first recorded output as a three piece, as Nicole Yun and Daniel Cudiff have added bassist Jonathan Woods. With the broader sonic complexity comes a slightly different and more sophisticated sound. Perhaps my best effort at a description would be a combination of The Sundays and Ride -- "dreamgaze" anyone? But heavier rock sounds still creep in to provide a distinctive accent to the proceedings. Correct Behavior is a satisfying album. It delivers hooky, full-bodied dream pop, and the music is diverse enough without losing cohesiveness. Moreover, I think it establishes Eternal Summers' bona fides as a band with the chops to evolve and gather fans in the years to come.